I’m happy to announce support for use of an Azure virtual machine as an Exchange 2013 Database Availability Group witness server. Automatic datacenter failover in Exchange 2013 requires three physical sites, but many of our customers with stretched DAGs only have two physical sites deployed today. 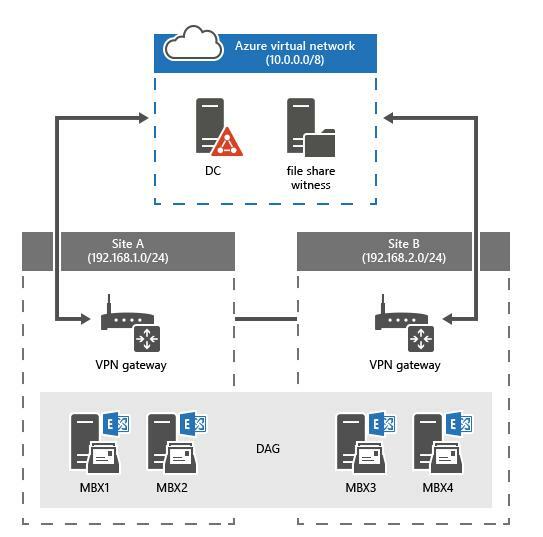 By enabling the use of Azure as a third physical site, this provides many of our customers with a cost-effective method for improving the overall availability and resiliency of their Exchange deployment. You can learn more about the deployment and configuration process, as well as learn about our best practices in the TechNet Library article. It’s important to remember that deployment of production Exchange servers is still unsupported on Azure virtual machines, so it’s not yet possible to stretch a DAG into Azure. This announcement is limited to deployment of a file share witness in the Azure cloud. Also note that this is not related to the “Cloud Witness” feature in the Windows Server Technical Preview. Stay tuned for future announcements about additional support for Azure deployment scenarios.